'Another Scorching Day' As Heat Shatters Records : The Two-Way High temperatures cooked up storms that lashed the Eastern U.S. overnight, and more than 2 million homes lost power. Friday, heat hit record highs around the country. 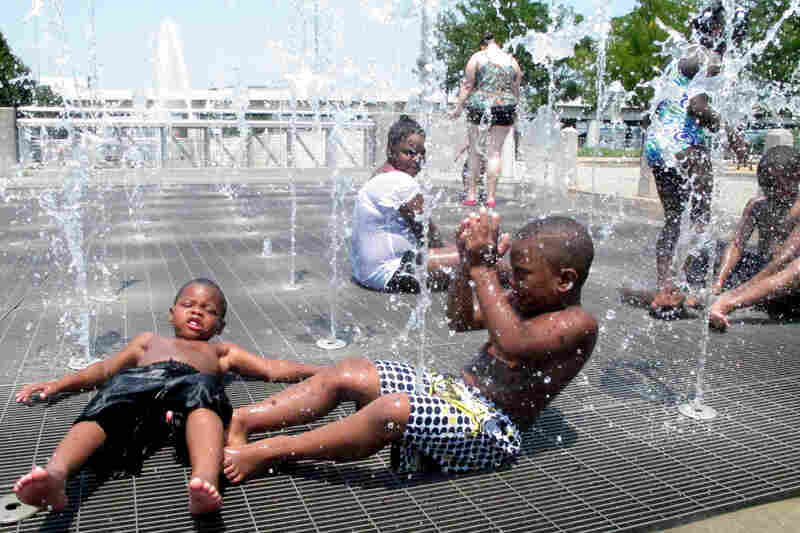 Children cool off from the intense heat at a waterfront park in downtown Louisville, Ky., on Friday. 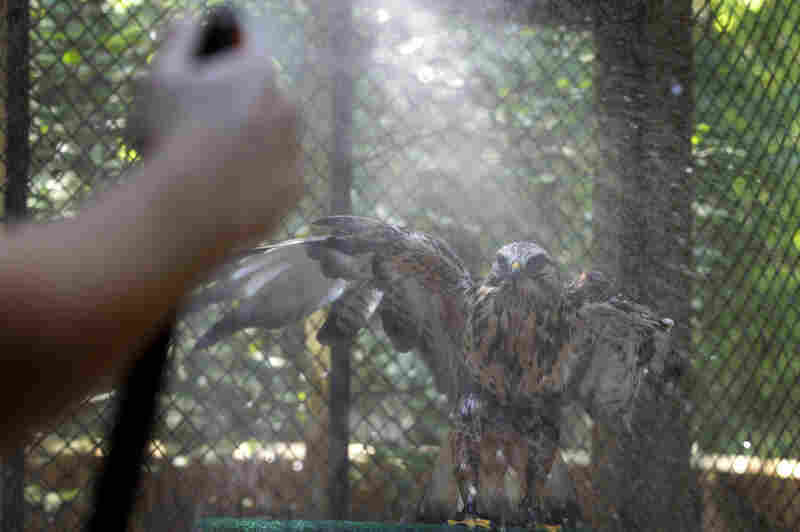 Aletta, a rough-legged hawk, flaps her wings as she gets a cooling shower from a hose at the Carolina Raptor Center in Charlotte, N.C., on Friday. 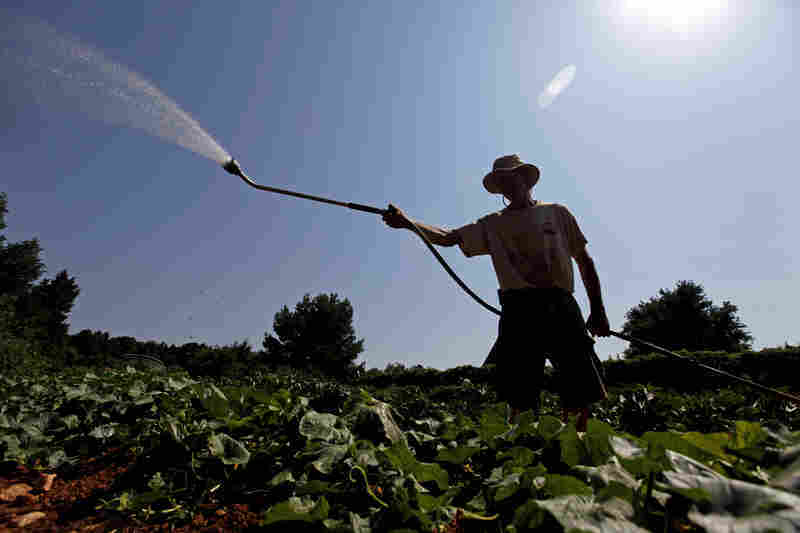 Doug Jones, owner of Piedmont Biofarm in Pittsboro, N.C., waters vegetables Friday as temperatures in the South soar. Triple-digit temperatures are expected for several days in North Carolina. 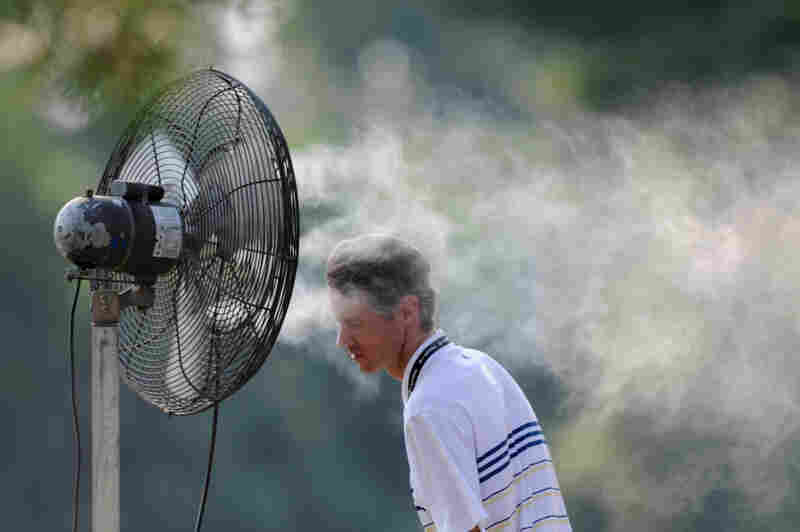 A spectator cools off with a spray mist during first round play Friday at the AT&T National at Congressional Country Club in Bethesda, Md. From left, construction workers Santiago Gomez, Jorge Moreno and Abel Lozano take a break from the extreme heat during a road construction project in downtown Chicago, Thursday. Little relief from the heat is expected in the next few days. 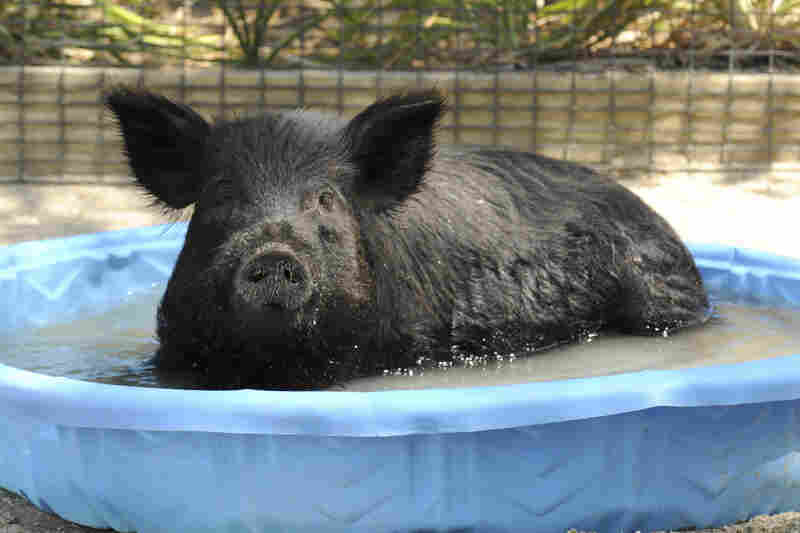 In this photo provided by the Chicago Zoological Society, Honey, a 2-year-old American Guinea hog at the Brookfield Zoo in Brookfield, Ill., cools off. Chicago White Sox' Eduardo Escobar closes his eyes as trainer Herm Schneider sprays him with cool water during a baseball game against the Minnesota Twins in Minneapolis on Wednesday. 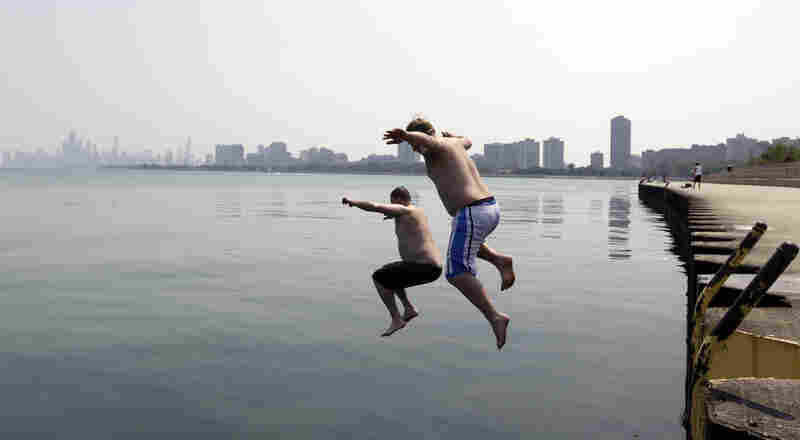 Jason Gerald (left) and Adam Hoffman jump into the Lake Michigan at Montrose Beach in Chicago on Thursday. It's been hot. Like sweat-rolling, thirst-inducing, hack-a-fire-hydrant hot. The heat cooked up storms that lashed the Eastern U.S. overnight, and more than 2 million homes lost power. The Weather Channel says there were "several all-time record highs" across the country Friday, including 109 degrees in Nashville, Tenn., and Columbia, S.C. As for the rest of the weekend, the National Weather Service doesn't anticipate much relief. With "another scorching day" expected Saturday, the Weather Service says thunderstorms will be a threat from Iowa to the Mid-Atlantic coast and parts of the Northern Plains. For farmer Tim Lenz in south central Illinois, the weather is taking a swipe at his livelihood. He tried to beat the heat by planting his corn early. But even in March, it was dry, Lenz tells Weekend Edition host Scott Simon. Lenz says he's lost about half of his corn already this year, and he'll just lose more without rain. The heat doesn't appear to be letting up. "We're scheduled to have 100 degrees every day for the next week here. So it's gonna get real serious." Cooler days are becoming a distant memory for much of the U.S., though a recent break in the weather has helped contain the Waldo Canyon fire that has been raging in dried-out Colorado. Monday, Talk of the Nation listeners explained the impact of record heatwaves on their respective corners of the country, sharing first-hand experiences with climate change.